If your Values and desires as a human being cause harm to others, you value the wrong things. You are not being open and non-discriminating. You are inducing panic attacks, aniexty attacks, putting children at risk. Leaving the percentage of sexual abuse/assault victims in America vulnerable. The LGBT community continues to harass the 96.6% of Americans, forcing their agenda on us. Karma? Possibly. But sometimes the needs of the Many outweigh the needs of the Few. And the Few are not worth accomodating when it puts the Many at risk. My costumed dye job is coming to an end as the blue is fading away. Having turquois hair taught me several things. People who color their hair are generally looked at differently. The genre of people who color their hair in vibrant shades are generally making a statement. I was inspired by Lyndsey Sterling in her Christmas music video from 2015. A gorgeous teal shade, well blended with purple and blue. Lighter hues of color instead of primary shades also work out better for you. I’m a classy sort of person who prefers to look nice when throwing clothes together. If my hair isn’t looking so great, I wear crotched caps. I do need more colored caps, but I have a white one, a designer black one, and a plain black one. These look especially great with t-shirts. If you have a polite, well mannered attitude with charism, more people are drawn to compliment you. I looked like an anime character, yes. But guys everywhere seemed to adore the blue hair. I was complimented left and right. Guys in business suits, guys from cars in parking lots, older guys passing in the store. The blue hair was a definite win. A great deal of women visibly disapproved. Oh well. Their loss. I have muted colors in my wardrobe. A lot of black, and gray, but darker greens and burgandy too. Not all of these wanted to blend with the blue. I looked clownish in some things, it was terrible. If I wore one of my hats or a neutral headband it wasn’t so bad. In a heartbeat. 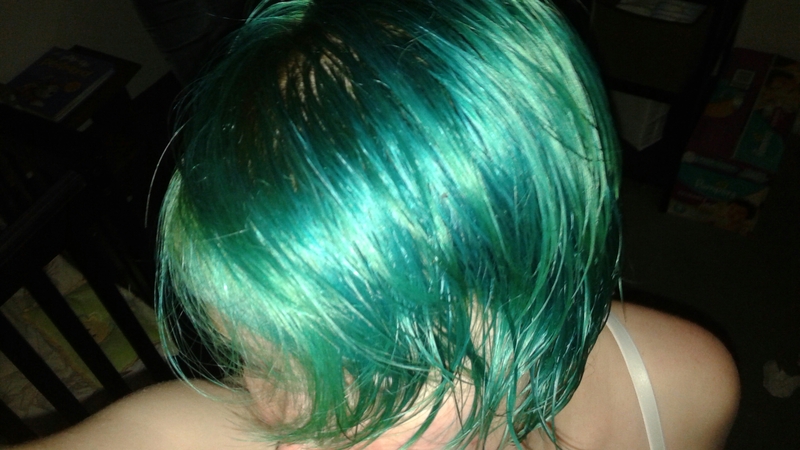 Thanks to Manic Panic vegan colors at Sally’s Beauty, I will definitely be trying it out again. I see your unshed tears sitting behind your eyes. The sorrow overwhelming your heavy heart. Let go of the burden and take my hands. They’re empty, they’re ready, they’re yours. Little black bird, flightless and weak, don’t let this hurricane drown you. Though you’re tossed in the wind, and your feathers are damp, I promise your wings will dry. The sun is always shining-though sometimes only above the clouds. We’re all caught in this everlasting Wheel, sometimes spinning out of control. Stop the endless despair and stretch your hand out for someone reach. Don’t go it alone. Let us protect you. Let us in. Here, let me show you the way. I just spent the last half hour engaged in physical exercise. My energy is up, my heart is racing, my mood is up, and I’m about to perform walking lunges up and down my hallway before laying down in bed to finish with simple leg lift variations. Perhaps add a bridge or six in there too. The point is, unless you DO what you mourn about, you’re never going to see the results that you’re moping about not having. Only YOU can shape your destiny. The latest trend in Gluttony and accepting your body in it’s unhealthy state of obesity? Be honest with yourself, you’re ONLY accepting it because losing weight takes months of hard work and a change of lifestyle. You can change. You can do the Thing! You can BE whoever you want to be. Strive for success and you’ll always win. Standing in the middle of the room, the walls seem as though they’re closing in. The door is cracked open, light gently peering in. Not enough to cause the darkness to flee. Only just enough to remind there is light on the other side. It only takes a few short steps to get to the door. To enter the hallway and be washed in that light. And yet, we hesitate. The raging emotions, terrifying us. Anxiety taking our breath away. What’s in the hallway? Will it kill us? Will it attack? Will it hate us? Alone we continue to suffocate in the darkness. It drives us insane. Wanting out, wanting to stay. Wanting to be free, wanting to stay hidden in the darkness. It only takes a step. One little step at a time to conquer the darkness. Freedom begins when you let yourself move. When you take that first step toward change.